Fage | AS/RS Case Study - Westfalia Technologies, Inc.
FAGE USA Dairy’s new plant in Johnstown, NY has a complete Westfalia Technologies, Inc. High Density Automated Storage and Retrieval System (AS/RS) with Savanna.NET® Warehouse Management System (WMS). The new Johnstown facility is FAGE’s first yogurt manufacturing plant in the US. Westfalia’s AS/RS will handle storage and picking in the 40° F warehouse. FAGE (pronounced fah-yeh), based in Athens, Greece, has taken the dairy world by storm with its all natural, premium yogurt that has a distinctly rich, creamy and fresh taste. The FAGE Total Yogurt is the #1 seller in Greece and has won food tasting accolades around the world. After much success in Europe, the company is expanding into the US market – its 28th country. FAGE has 3 state-of-the-art plants in Greece, which are substantially automated. The company philosophy incorporates automation as a means of competing efficiently, and maintaining product safety. Their experience with automation and its rewards means they are well versed in the specific features they required from an AS/RS. Their requirements include the handling of buffer product from manufacturing, full pallet movement, case picking, and buffered pre-picked material back into the AS/RS for future retrieval for truck loading. FAGE USA handles individual orders, distribution center orders, and combinations of both. They order pick “just in time” as well as days in advance. FAGE’s yogurt and cheese products come on trays and cases. Each pallet has either 240 or 180 trays, depending on the size of the product. The AS/RS handles pallets 40’w x 48’l x 78”h. Pallets are loaded into the AS/RS with a single SKU from manufacturing via the cooling tunnel, or via the docks where some cheese SKU’s arrive from Greece. Pallets must be loaded so the product on the bottom can handle the sustained weight, forcing shorter load heights in certain cases. And as future growth demands, the number of SKU’s and case sizes will grow and change. To meet these requirements Westfalia initially designed and built a 1,600 pallet free standing rack warehouse utilizing our high density AS/RS. Within three years demand and growth were such that the crane aisle has been extended with more racking and gravity flow pick lanes to accomodate an additional 2,460 pallets. 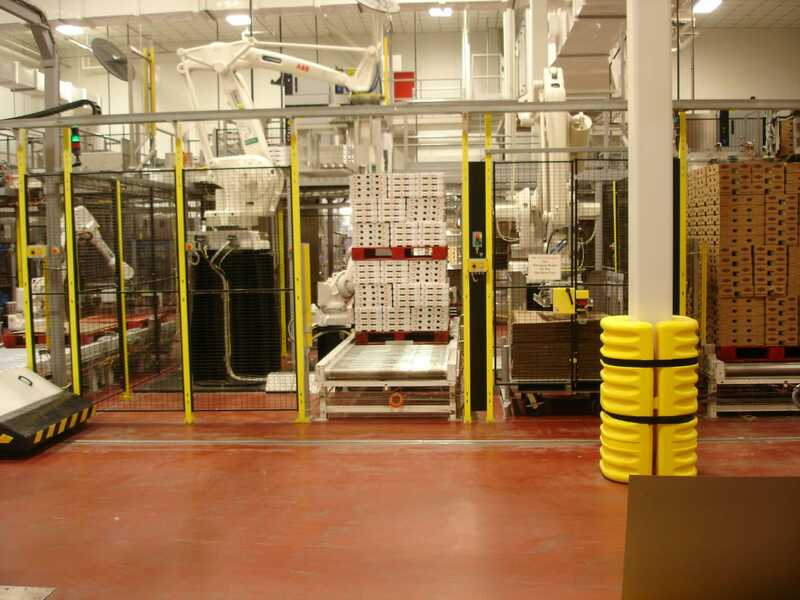 Today, Westfalia’s Automated Storage and Retrieval System consists of one Storage/Retrieval Machine (S/RM), a complete pallet conveying system, gravity flow pick lanes, bar code scanners, stretch wrappers, label printing and placement equipment, and Savanna.NET® WMS to control the product flow throughout the facility. The AS/RS measures 33’ high, has 4 levels, and stores in total over 4,100 pallets. Our Satellite® entry vehicle stores pallet loads 5-deep on one side of the aisle and 11-deep on the other side. All pallets are supported on our 3-rail system which provides a safer, more reliable system as pallet deflection/breakage is eliminated. 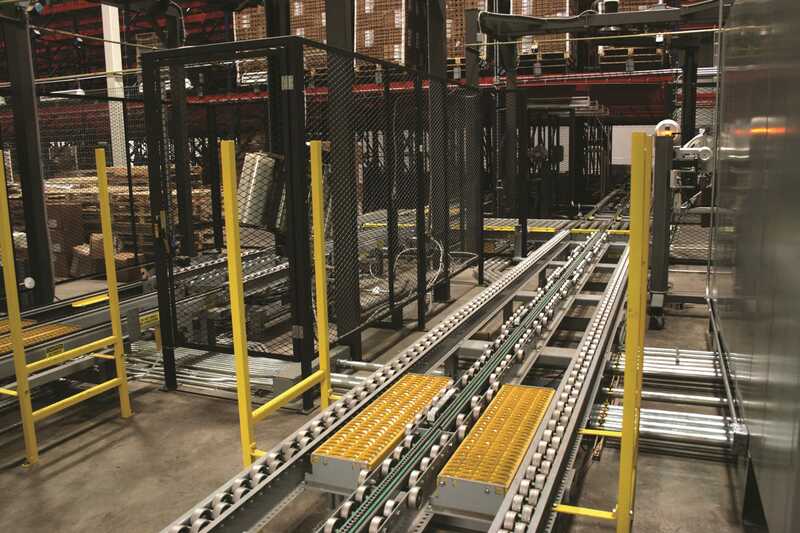 Gravity flow rail pick lanes are located in the first level of the rack on the dock side of the warehouse for filling less than full pallet orders. Products can flow from the AS/RS to the picking lane or to the full pallet output where fork lift trucks can pick up pallets and load the trucks. Westfalia’s high density technology enables flexible AS/RS designs, and a key feature of this system is its ability to accommodate growth. 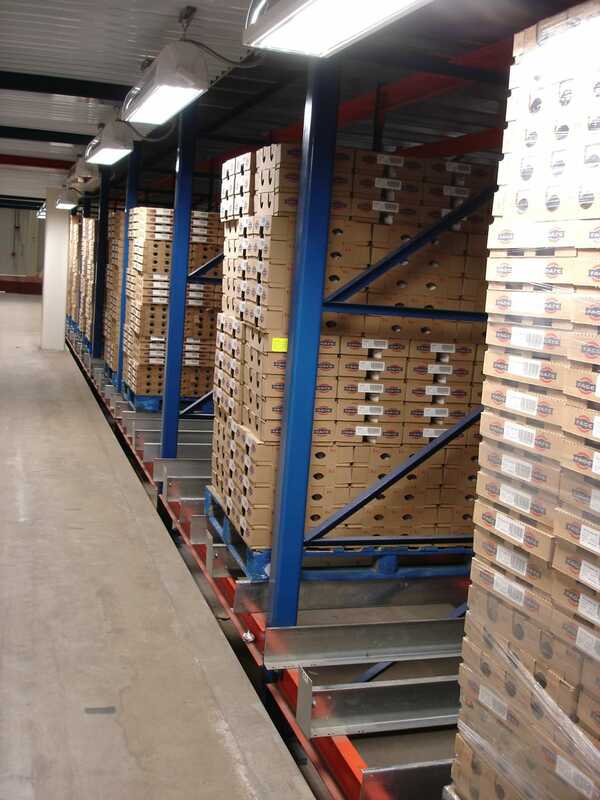 FAGE’s growth has been managed through extending the crane aisle for more storage lanes, and the depth of those storage lanes. The expansion area’s cubic space above the new pick lanes has been extended to 11 deep on levels 2 and up, thereby providing an additional 509 pallet storage locations (26% more storage) in addition to the 1,960 from the crane aisle extension. If not for Westfalia’s ability to program the Satellite to extend 11-deep into the racks, these 509 places would have required a 25% larger building expansion. Savanna.NET® Westfalia’s modular Warehouse Management System (WMS) controls the movement and storage of all pallets within the facility. It initiates control of yogurt products at the shuttle car interface from the cooling tunnels, and for the cheese products as they enter from the dock side. To track each pallet load, a bar code reader, which interfaces with the WMS, is positioned at the infeed conveyors from the cooling tunnels and the dock area. Pallets moving both into and out of the AS/RS utilize an accumulation conveyor system which includes a profile checking station and a load squaring station. The accumulation conveyors smooth throughput surges and ensures a more streamlined flow of material between the AS/RS and order processing. Savanna.NET® controls the order picking systems, interfacing with portable RF equipment carried by the pickers in hip holsters. As the pallet loads leave the AS/RS area, a print and apply bar code device prints and automatically places labels on the outside of stretch wrapped loads. 30% reduction in energy costs due to efficiencies of AS/RS systems -- reduced lighting, regenerative SRM braking, smaller area to cool/freeze, etc.